Dolphy's style of comedy is ancient and no longer amusing. The jokes are corny and the technique, slapstick. But there are a handful of good drama scenes at least. Many shots are unclear and there are many unnecessary close-ups. G Toengi is irritating, which is good because maybe that is what's really intended for the character. Or perhaps, she is just plain annoying in the first place. Eugene Domingo and Gloria Romero are underutilized. Eddie Garcia is not very funny, at least he finally gets an MMFF role where he does not have to emulate Yoda in Chinese. The narcoleptic guy ceases to be funny after a few minutes because of his repetitive shtick. Pokwang is inconsistent and very obvious as an old woman. Blame the makeup and prosthetics department. Everything just seems rushed. The movie shuttles back and forth between past and present. It tells about the life of old vaudeville star Juan, who gets separated from his friends during the war and now lives in his son's retirement home in Chicago. This character is played by Dolphy, and Epi Quizon does a convincing job playing the younger version of his real life father. Eddie Garcia is the partner with hidden feelings for the love interest, younger version is played by Vandolph. Gloria Romero is the love interest, the beauty of whom during her youth is given justice by Heart Evangelista. Pokwang plays both her young and older self, with inconsistent makeup and prosthetics. Juan sees an opportunity to reconnect with his lost friends via the TV show Wowowee. And so he decides to go home and try his luck to get in the show, discovering secrets and strengthening family ties along the way. Willie Revillame is as plastic as Orocan and Wowowee is a despicable show. They capitalize on human emotions for entertainment. But a lot of people actually enjoy seeing someone more miserable than they are. Hence, the amusement. But seeing this movie makes you see the show on a different light, from the perspective of Filipinos suffering from homesickness in a faraway land. For me this show is trash, but for them, it is their connection to the Philippines. Perhaps that is the reason why this show keeps on airing despite all the controversies and bad ratings. There is a clamor for it, not from home, but from abroad via TFC. That is if this movie mirrors reality, at least in the US. 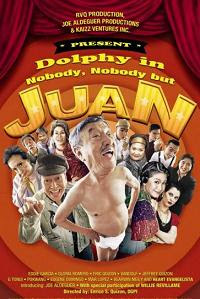 Most of the cast are Dolphy's relatives. Five of his kids are here playing supporting roles, including Eric Quizon who also directs. I have read somewhere that they came up with the concept for this movie in 30 minutes. It is quite evident in the finished product. There are a lot of extras in this movie, most of which are has-been comedians and wannabes, with the exception of Eugene Domingo. The movie is boring and does not evoke a lot of laughs, unless you are shallow and you enjoy seeing people getting intentionally hit by a rolled newspaper on the face. And Willie Revillame is here too because Wowowee is involved. The only saving grace of the movie is its honest look on the lives of old people, which you could probably see somewhere else.